Do You Know There is Limit For Every Relationship? - You Are A Genius You Are A Genius: Do You Know There is Limit For Every Relationship? Do You Know There is Limit For Every Relationship? : Many relationships today has folded because from the onset they never had limits for anything at all. To others they feel like having a limit is not meant to be, instead they say that, it's being dishonest or secretive. Of a Truth, we are getting it all wrong. I have many reasons why I have to tell the upcoming youths or teenagers who are yet to meet new people outside their world. When you set a boundary in your relationship, you will have to give a say about it when the time comes. All I need you to do today is to continue reading this post till the last line so as for you to grab the limits in relationships. You might be wondering right inside of you, why will there be limits for you in a relationship with someone you love and you want to be with all the days of your life. It's not bad if you think like that, the reason is that everyone in life deserves respect, whether you are young or old. You are worth your respect. Now, let's tell you some policy you were supposed to have before finalising any relationship at all. * You must have a boundary of not Sharing your matrimonial bed with any visitor, the reason is that it can shatter your relationship with whom do ever it is you are in love with. 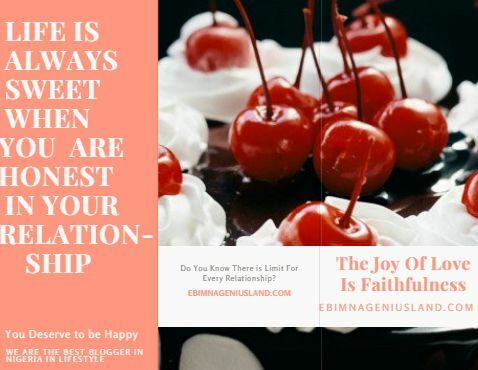 * You are to never have an external relationship when you are in love with your spouse, and then he/she finds out that you are looking forward to have someone else share your heart with him/her. It's mostly discouraging and also speaks how unfaithful you are in the relationship. Also Read, How To Return Back To Your Ex - You Still Miss Him/Her Sometimes! * There should be no discussion of your relationship Outside your home. Many people have scattered their homes unknowingly in a way that they go along the street telling their street friends how they're been treated by their lover. At a point they'll give you an advise that will distort your relationship from the Joy it used to produce. Everyone is advised today to be careful of who they tell things about their personal lives. * Stand on your word. When you ever draw a line of boundaries on your word, them you have accomplished so much in your life and relationships too. Don't dance to other People's tone, When you make a positive declaration make sure have a strong stand on your word so that you will have your personal respect in your relationships. ADVICE: Maintain yourself as a gold and diamond you are, Don't be the reason why your relationship is being scattered TO zero, be faithful to your partner. Make sure you don't cheat on your partner and if he/she intentionally does that for you not to know and you find out, remember to settle matter gently and try to forgive each other and never to do it again.